Cover artwork: Table Music from Remède de Fortune. Truly, it seems to me very unusual and very novel … in my opinion, it is a long time since I have made anything so good. This is the most prolific composer of the fourteenth century, Guillaume de Machaut, referring to a polyphonic song that he had recently composed. Although Machaut is describing the individuality of his own work in this letter, his description of the ballade in question as ‘very unusual’ (mout estrainges) and ‘very novel’ (mout nouviaus) evokes the whole repertoire of fourteenth-century French music. In Middle French estrainges means ‘unusual’, ‘strange’ or even ‘incomprehensible’, and it is easy to believe that Machaut and other composers of the Ars Nova were proud of the exotic effects that their music released when performed, effects so fleeting that they cannot all have been foreseen during the compositional process. Sometimes, it seems, the French composers of the fourteenth century directed their parts with a mischievously subversive attitude to harmony that was not shared by their successors in the fifteenth. It is hard to imagine the mature Dufay, for example, creating the wanton minor second that Solage produces, by impeccable melodic logic, in the third measure of Tres gentil cuer. As for Machaut’s nouviaus, its meanings are similar to estrainges, including ‘unusual’, ‘original’ and ‘novel’; like estrainges, it seems designed to present composition as an exploratory and innovative process, and indeed the sheer originality of much fourteenth-century French music is very striking. Once we have penetrated sufficiently far into this repertoire to see beyond the obvious similarities of style and technique which characterize all Ars Nova chansons, we find that the variety of the music is inexhaustible; in piece after piece it seems that a composer has looked for a fresh solution to the artistic problems of making a successful polyphonic song. Some composers settle for the kind of simple loveliness that distinguishes many of the finest fourteenth-century French songs, especially those to be found among the hundreds of anonymous pieces. Puis qu’autrement ne puis avoir is an example. Others, however, look further afield. Soit tart, tempre, main ou soir explores the possibilities of a carefully controlled, luxuriant harmony in four parts that is deliciously embittered at certain points by musica ficta adjustments (primarily some strategic uses of G sharp) that owe something to the mature style of Guillaume de Machaut, both in his secular works and in the Messe de Nostre Dame. From the number of sharps in the sources of this piece it is plain that the scribes who copied Soit tart, tempre, main ou soir were not sure how far this process of musica ficta colouring should extend. In Tres gentil cuer we hear Solage, one of the most gifted composers of the fourteenth century, working with three parts to develop some of the ideas that reach their zenith in his four-part virelai Joieux de cuer, which can be be heard on The Medieval Romantics (Helios CDH55293). These include an almost relentlessly polymetric texture (in which, to use modern concepts and terminology, 3/4 is constantly set against 6/8), and the rhythmic figure in the Cantus, a fingerprint of Solage’s style. In Quand je ne voy Guillaume de Machaut sets out to spin a substantial piece with only the barest minimum of text, setting certain syllables to extended melismas that use melodic sequence, a device that occasionally attracted him. The musical setting follows the metrical structure with complete fidelity. The sheer verve of the pieces recorded here accounts for much of their attraction. They defy any faint-hearted performance. A passage from Machaut’s Donnez, signeurs offers a particularly striking example (Example 3). In measure 9 the Contratenor provides a momentary pedal point beneath a flourish in the Cantus that audaciously snatches at F sharp (a pungent note in a piece built on C and F) and which seems particularly extrovert for the way the upward movement e–f–g is rushed through twice in succession. The fluidity of the Cantus throughout this section—and the inability of modern notation with regular barring to express it—is shown by the brackets above the stave which mark out what are, viewed in rhythmic terms, four virtually identical phrases. They are superbly balanced in their rhythmic weight and melodic contour. As these phrases dash past, the Contratenor chases the Tenor in measure 11, just a quaver beat behind, invigorating a simple cadential pattern with displacement syncopation that resolves quite conventionally in measure 12. The accented dissonances in measure 11 also contrive to give that measure a thrilling sense of forceful and directed motion. As yet there is remarkably little evidence that polyphonic rondeaux, virelais and ballades of the kind composed in France were much appreciated in England. Consequently, the English pieces on this recording are all either Mass compositions or devotional works with Latin texts. The anonymous Sanctus can claim to represent a strong fourteenth-century tradition in English Mass music: sonorous and highly succesful within certain bounds. Each voice declaims the same words at the same moment which enhances the sonorousness of the piece by synchronizing the vowels. The Marian Regali ex progenie by Fonteyns represents a slightly more elaborated version of this same technique, and one which even the Old Hall composers of the front rank (such as Power) continued to cultivate. In contrast, the isorhythmic motet by Sturgeon, Salve mater Domini/Salve templum gracie, comes from the youngest layer of the Old Hall repertoire and has a strong claim to represent one kind of English music that impressed continental musicians in the earlier fifteenth century. By far the most impressive of the English pieces—and perhaps the most impressive piece on this recording—is the four-part Credo by Pycard. This composer is possibly to be identified with a singer of that name who was a clerk in the chapel of John of Gaunt, Duke of Lancaster, around 1390 and perhaps still there in 1399. This piece, which is vast by medieval standards (for it runs to some six minutes of through-composed polyphony in four parts) places Pycard into the front rank of European composers between the 1380 and 1420; taken together with his other works (such as the five-part Gloria recorded by Gothic Voices on The Service of Venus and Mars, Hyperion CDS44251/3) they show him to be perhaps the most talented composer on the European scene during those forty years. He outclasses the much more famous Ciconia, whose Mass music is of limited interest for the most part, and what Ciconia has in his best motets—a rhythmic energy, a love of short melodic phrases that chase one another in the upper voices in a most exhilarating way—Pycard also has. (Indeed, there is much in Pycard’s music that one might wish to trace to Italian example.) Pycard brings to these things a love of full, triadic sonority that is alien to Ciconia and distinctively English. Baude Cordier’s Ce jour de l’an represents a category of piece—the New Year song—that seems to have sprung into existence around 1400 and which is undoubtedly connected with the giving of New Year presents (a ceremony lavishly described in an English context in the Middle English romance of Sir Gawayn and the Green Knight). The tone of such festivities would seem to have suited the new mood of the French chanson after 1400, lighter and fresher. Cesaris was one of the composers who, according to Martin le Franc, enjoyed great success in Parisian circles and whose music was fashionable before the advent of Guillaume Dufay and Binchois. His rondeau Se vous scaviez, ma tres douce maistresse is a fine example of early fifteenth-century song style: a relatively plain, compact and memorable melody is set over a Tenor and Contratenor that create dissonance in a highly controlled fashion. (Sheer tunefulness, in a form that modern listeners can often instantly recognize, is a priority with early fifteenth-century French composers.) His double rondeau Mon seul voloir/Certes m’amour, a ravishing piece, has all the same qualities and there is no difficulty in understanding how such a piece might have ‘astonished all Paris’ in the words of Martin le Franc. 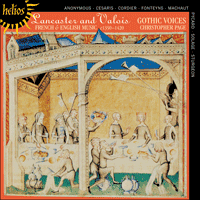 Lancaster and Valois: the two royal houses that reigned during the periods of English and French music presented on this recording. The English pieces by Pycard, Sturgeon, Fonteyns and the composer of an anonymous Sanctus, have been taken from the Old Hall manuscript, the celebrated collection of English liturgical polyphony that was probably compiled for use in the chapel of Thomas, Duke of Clarence. The French pieces include four by Guillaume de Machaut, whose musical and literary works attracted the attention of some of the highest in France during the fourteenth century. This recording opens with his flamboyant ballade Donnez, signeurs, a call to the magnates of France to show largesse in accordance with their exalted dignity. Of the other composers featured here, Solage composed one piece in honour of Jean, Duke of Berry and another (Le mont aon, not attributed to him in the sources) in praise of Gaston Phebus, Count of Foix and Bearn. Cesaris, whose music was much admired in Parisian circles during the early fifteenth century, served the Dukes of Berry and Anjou, while Baude Cordier served the Valois Philip the Bold, Duke of Burgundy as a valet de chambre in the 1390s (if he is to be identified with the harpist Baude Fresnel, which some are inclined to doubt).